As Jony Ive says, doing something that’s better isn’t just doing something new. A lot of new apps are built every day but only the best ones stand out. 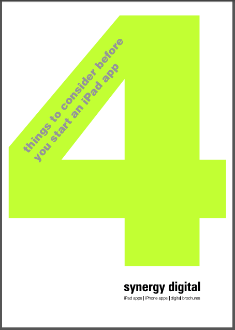 These are the key things we think you should think about before you decide to press ahead with developing iPad apps. 1) What do you want your app to do? 2) Should you charge people? 3) How do you want it to look? Synergy Digital is a leading iPad app developer, iPhone app developer and digital brochure developer located in Warwickshire. Synergy Digital has clients throughout the UK in many different sectors and for many different reasons. Our expert team of app developers and our creative design team are capable of making your brand really stand out. ¹²³⁴⁵⁶ Apps not developed or published by Synergy Digital. All apps are purely examples of the quality and functionality of apps that we can build.